Some people have cool jobs! Over our final full English breakfast of the trip, we chatted to a young ornithologist who was spending a few days in the area studying specie numbers on a given patch allocated to him. This meant that he had to get out of bed before dawn, drive for half an hour, and spend an hour observing and counting species and varieties of birds. We assumed he was having his second breakfast of the day. At first I thought he had an enviable way of making a living……but then I wasn’t considering the variable weather he would have to endure to complete his studies. Perhaps spending a lifetime in the classroom wasn’t such a bad option after all. This was a day of crossing, and re-crossing the same railway line…..some 7 times in all, and it wasn’t always straightforward. Two of the crossings were closed to traffic, but allowed access to pedestrians and cyclists. 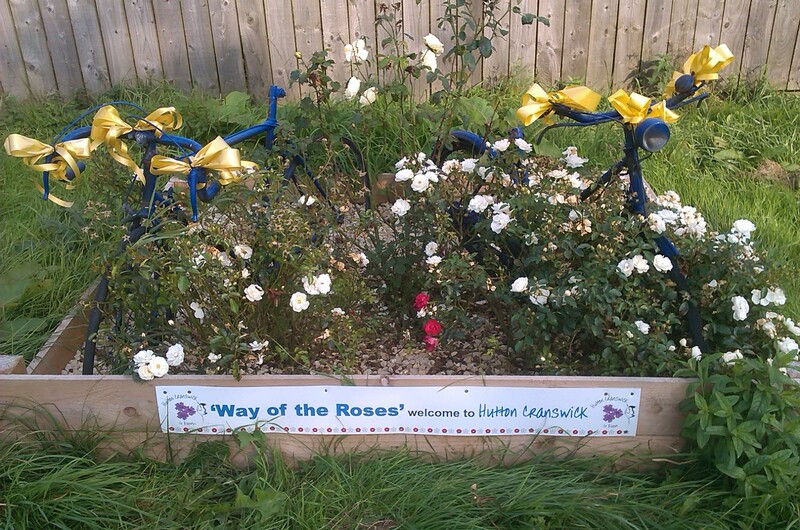 Well, that’s all fine and dandy….but they hadn’t allowed for tandems! I mean, how do you get a tandem through two kissing gates…….? 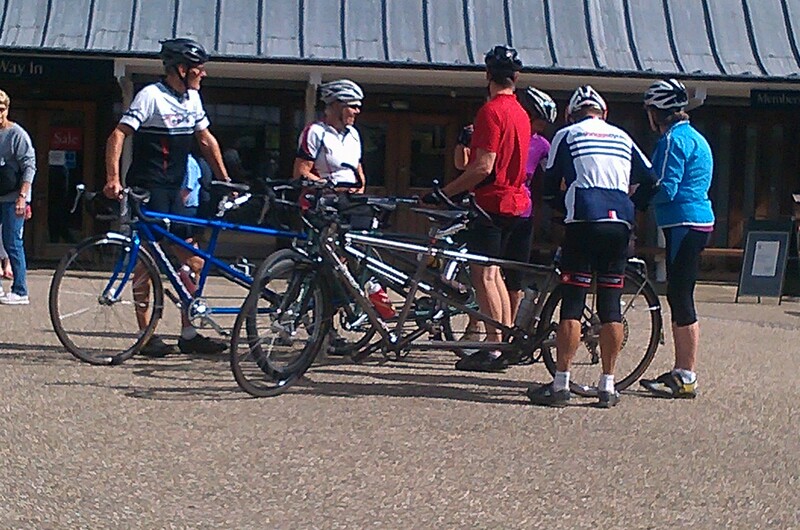 And yes, we had to unload the panniers and part-lift the machine over the barriers. 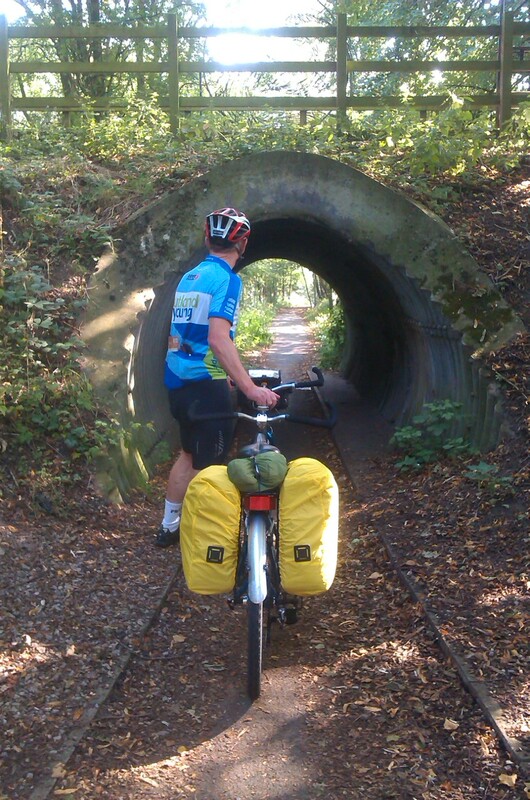 Hey ho…….the trials and tribulations of double bikers. 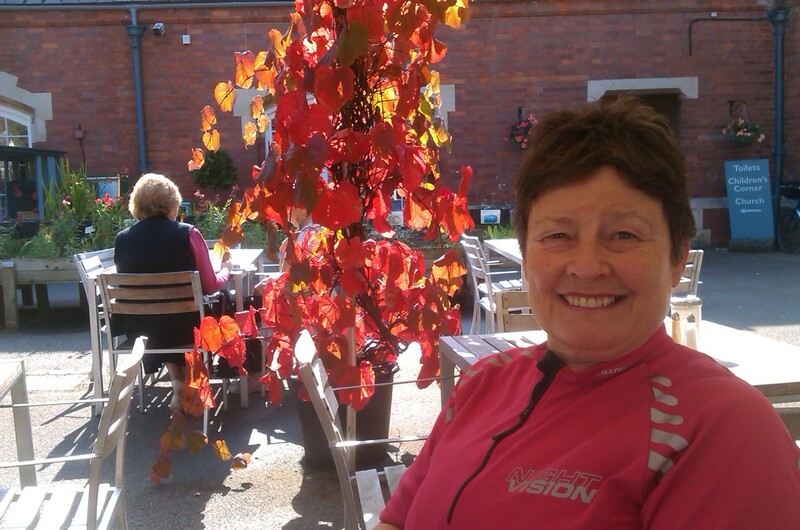 Happy in the knowledge that the end is nigh…..
One of the delights en route to Bridlington was stopping at the Manor House of Burton Agnes, where we found one of the most perfect tearoom terraces. It was tempting to linger longer in the pleasant surroundings, but we decided to look around the medieval Manor House, cared for by English Heritage, and free to enter. An unexpected little bonus. 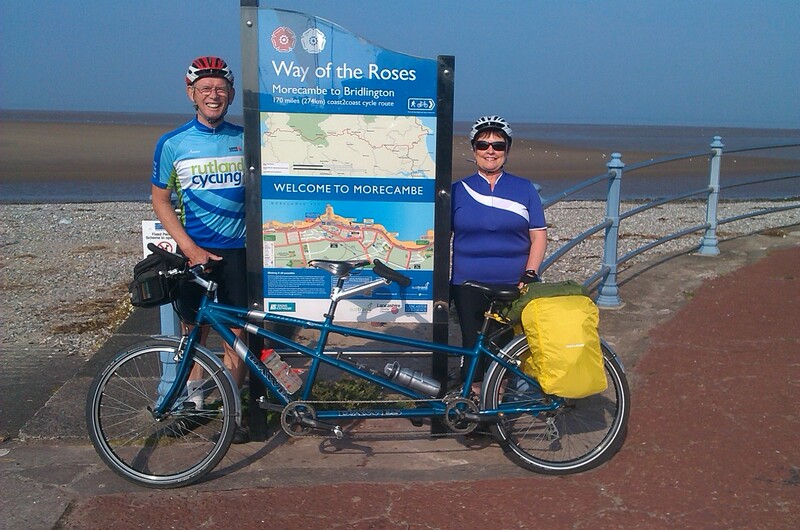 Then joy of joys, we may have completed the Way of the Roses, but we had saddled ourselves with an extra 12 miles to Filey, having been kindly offered the use of a holiday cottage by a friend and former pupil. It turned out to be a beautifully refurbished (and extended) fisherman’s cottage, with a bait house that perfectly fitted the tandem, and a bedroom view of the sun rising over the sea. 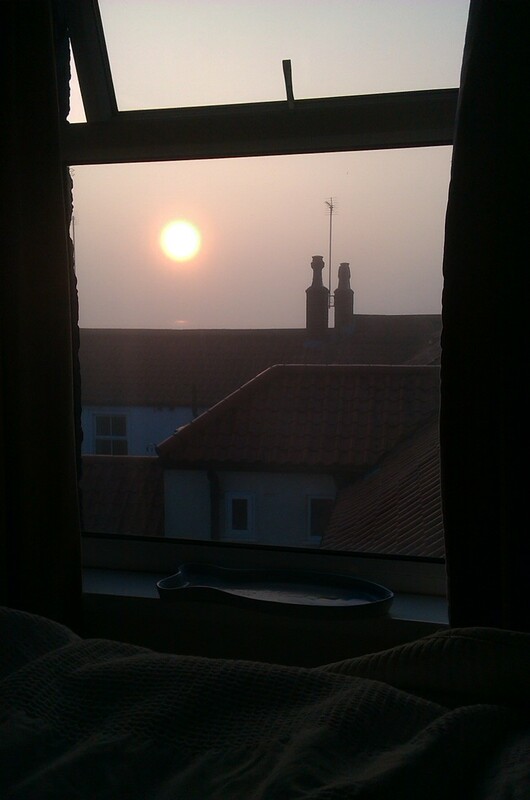 As I opened my eyes on the first morning, I was greeted by an autumnal sun rising through the mist over the water. One thing you must understand about the National Cycle Network……it seldom takes the shortest route to a given destination. Why? Well, you could say that cycling between any two points should be about the quality of the experience and not about the speed of arrival…….I know some will say that is a moot point, but SUSTRANS (the charity that creates and maintains these routes) seems to have a clear philosophy…..which is borne out by the indirectness of many of their routes. miles away (according to a signpost), but 15 miles later, we found ourselves entering the outskirts of the town. No sooner had we left Dunnington, we found ourselves heading east on Route 66. I think it was no accident that SUSTRANS chose to christen this Route 66: like its more famous sibling it runs east to west (Spurn Head to Manchester), but I am sure it has never been used as an important migratory route in the demographic history of this country. I could be mistaken. Going through Stamford Bridge made us realise that we have passed a lot of battlefields in the last few days. 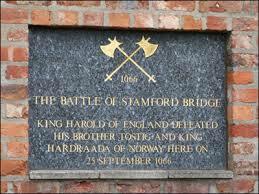 If King Harrold had not had to rush north in 1066 to stamp down a rebellion led by his brother Tostig, who knows what the outcome of the Battle of Hastings would have been. The history of the last 1000 years of this country could have had a very different complexion. And I know many would say ‘for the worse’……. As we headed further east, we were reminded that climbing was not just a thing of the Pennines….we had the Yorkshire Wolds to climb over. 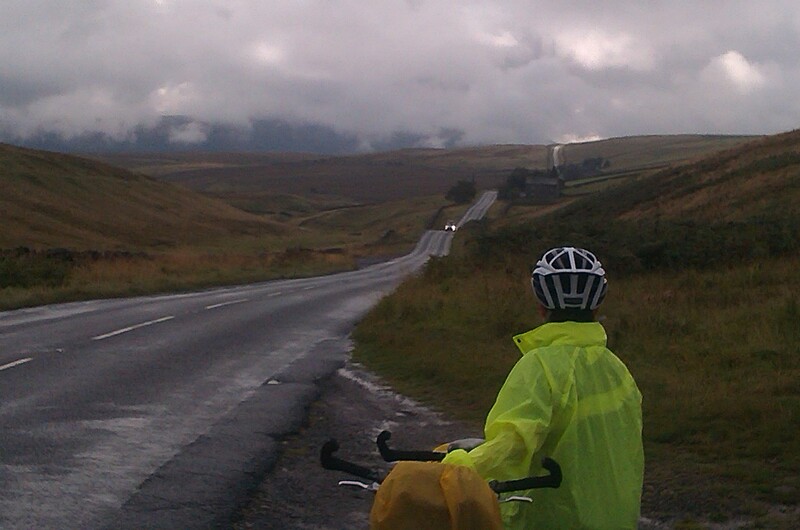 Not as brutally steep as the Pennines, but there were some long arduous climbs. 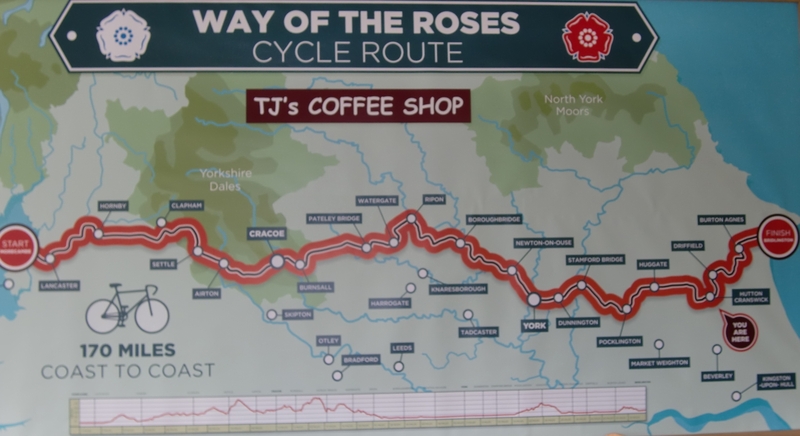 And as we were recovering from our exertions in a garden centre tearoom, our attention was caught by this mural of the Way of the Roses. We liked it so much we enquired about the availability of paper copies……but no, the mural had cost them £400, but it was just that……a painting on a wall. 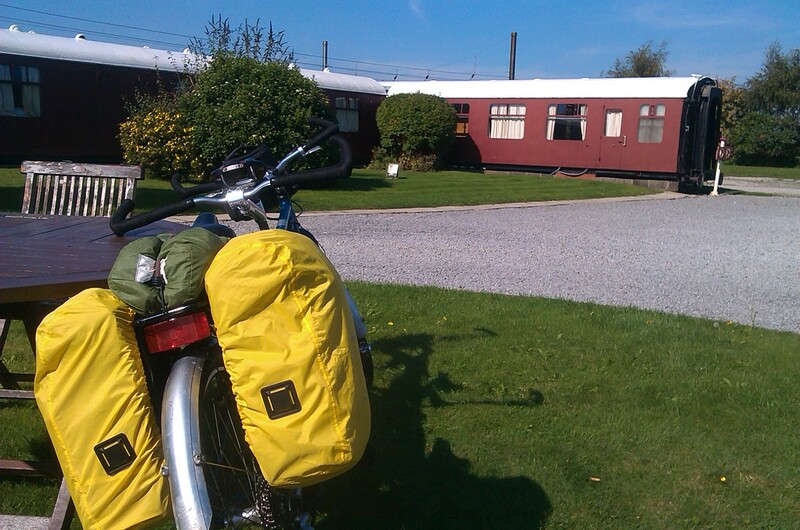 When we arrived in Driffield, I was intrigued by the name of our accommodation: Hotel 41. Disappointingly, however, the number simply referred to its door number: 41 Market Square. But you can imagine our further ‘disappointment’ when they informed us our room was being decorated, and would we mind having an upgrade? I do like the dry humour of Yorkshire people. Unbelievably, we had the prospect of a whole day without any significant hills! 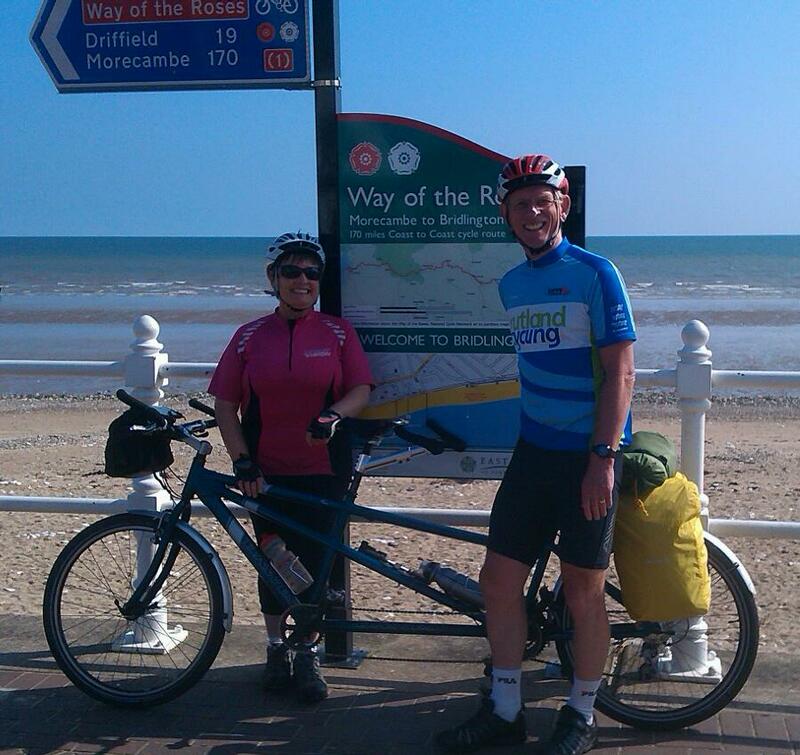 And what’s more, the breeze was in our favour…..surely we hadn’t died in the night and gone to cycling heaven? The pace was brisk, we followed the Ouse in the direction of York, when I remembered there was a café on the site of old railway sidings near Shipton. 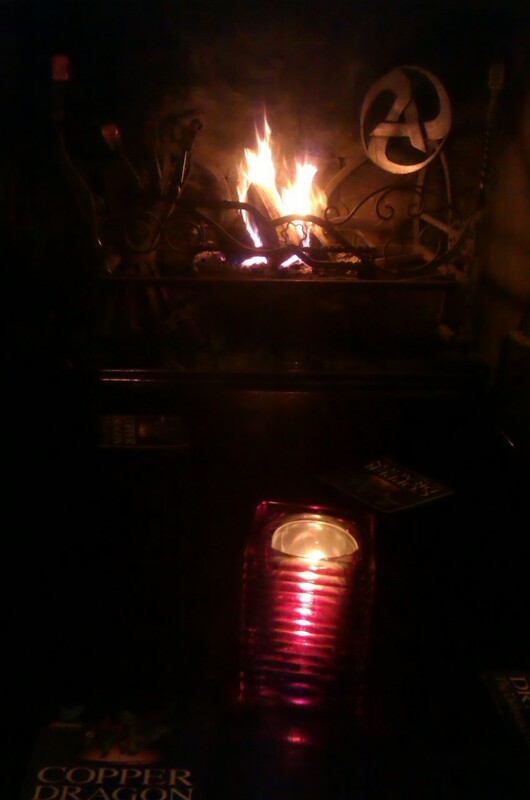 We found it, sat in the conservatory, and vacantly watched trains speed by along the East Coast line. But this was no ordinary café……..it was also a restaurant and B&B….but the accommodation for both was in old train carriages that had been specially refurbished. I wondered if a night’s stay included the rhythm a sway of a train in motion, and the clickety clack of the rails under-wheel…..now that would have been original. 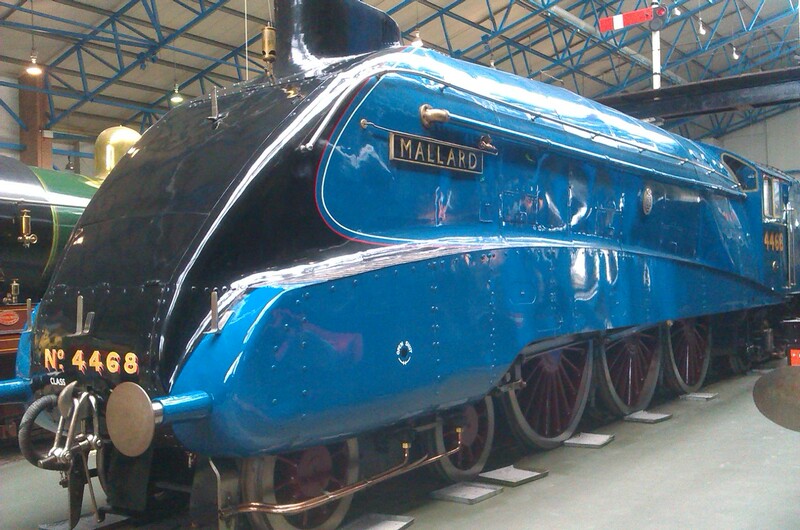 When we arrived in York, to continue the theme of railways, we spent 3 very enjoyable hours loitering with intent in the National Railway Museum. 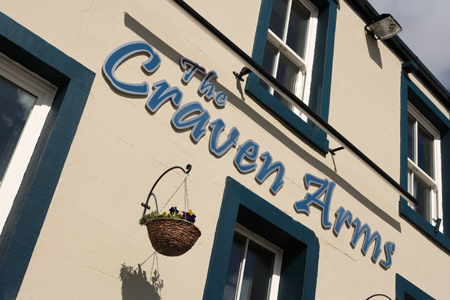 Not only can you enjoy a meal in a re-creation of a restaurant car, but you can also go for a guided tour of the famous royal carriages, and if your stomach is in order, enjoy a simulated experience of the Mallard breaking the world steam locomotive record of 126 mph. When we read the long list of precautions (heart problems, high blood pressure, pregnancy…….etc) we wondered if anyone actually ever qualified to enter the capsule……. 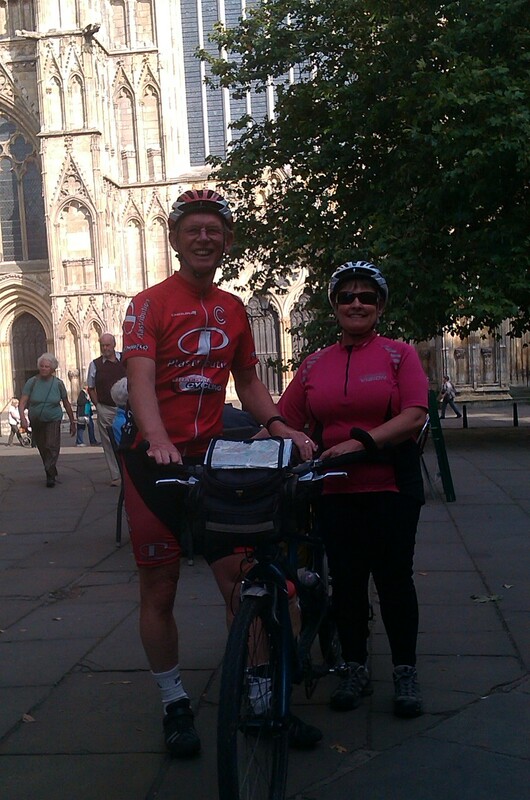 And then a quick zoom into the centre of York to have one of those very irritating “we woz ‘ere” photos taken outside the Minster, and then we battled our way out of the city, joining the homeward surge of commuter traffic, to find our overnight stay outside the village of Dunnington, and later to join our friends David and Marion for an evening meal. Perhaps the best day of the ride so far. Breakfast this morning revealed a group of cyclists who were doing the Way as a supported ride….in other words, they had a sag-wagon carrying their luggage, and a leader arranging café stops and meals in the evening, as well as all the accommodation. We chatted to a lady in the group (riding a small-wheeled Alex Moulton) who was feeling the strain of being over-organised…..which only served to confirm for us that doing these rides independently is the best way. Or in the words of the pessimist: “you make your bed and lie on it”. Well, given that we had just spent 8 hours lying on a super-comfortable bed, it was now time to consume the full English and get back on the road. So, were the big climbs now behind us? Well……kind of, but not quite. 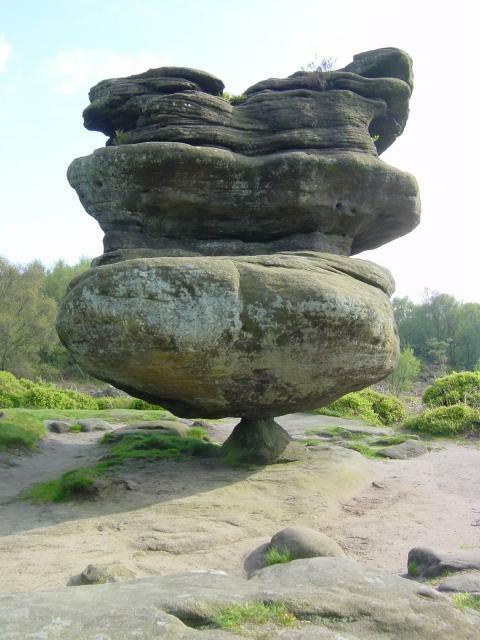 One more remained, over Brimham Rocks, and I knew it well……I had climbed it only two weeks before on my solo, and I knew it was going to be touch-and-go on the tandem. And sure enough it was….so for one final time (? ), we dismounted, but this time safe in the knowledge that the rest of the day would be a ‘breeze’…….after all, there would be several miles of descent to the Ouse valley and, of course, we all know that rivers never flow uphill……..
A refreshment stop at Fountains Abbey saw us join a ‘confluence of tandems’, which I craftily inspected while the owners were putting miles back into their legs inside the café. Very nice machines, indeed. Two Santanas and a Thorn…….roughly with a combined value of some £25,000. Yes, we are talking about serious investments here…….not the sort of things you randomly leave outside of cafés without a secure lock. And when the owners emerged to mount their steeds, they all had the air of being life-long thoroughbred tandemists…….there was effortless coordination in their mounting and taking off, and an ease about their style of riding. We couldn’t pass through Ripon without paying a visit to the Cathedral, and had heard beforehand that it was hosting an exhibition of local artists. I have to say that our attention was captivated as much by the art as by the building…..the two together made for a fascinating hour. 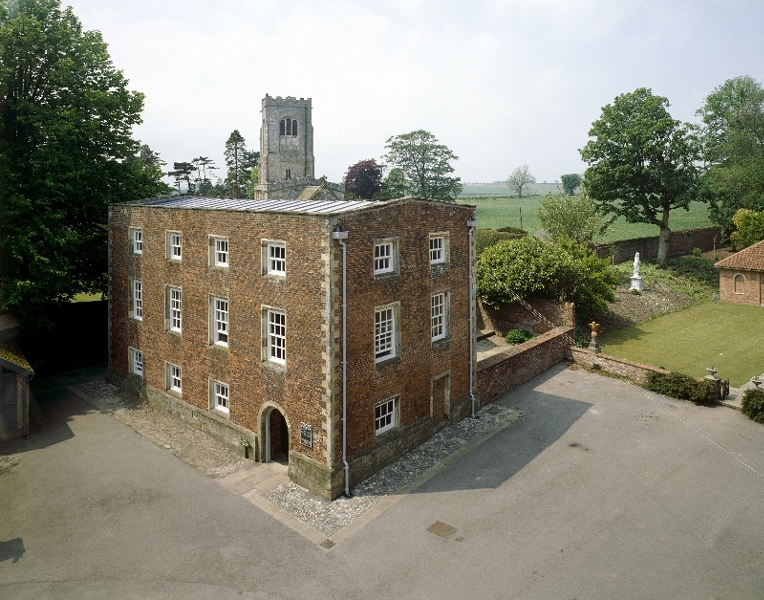 And so to Boroughbridge, close to the scene of the famous battle of 1322 between Edward II and his rebellious barons, and roughly the halfway point of our own ‘battle’ of the Way of the Roses. And the sun was shining…….. 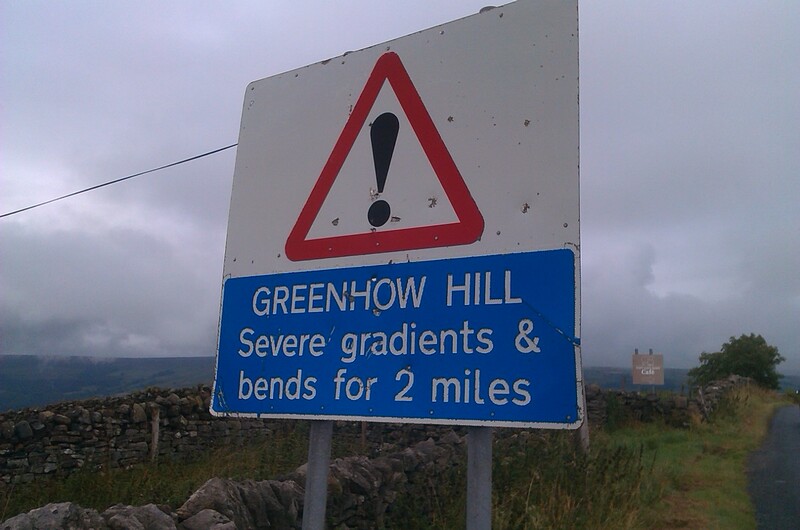 The Pennine hills usually have a nasty sting in their tails. Every time you go around a bend, hoping the climb is about to end, you realise it is only a false summit. On one occasion, we were at our limit, slowly grinding our way to the top of a long drag. Around the bend was a suggestion that we were topping out…..but no, the climb uncomprehendingly continued for as far as the eye could see. We had hit our limit……. 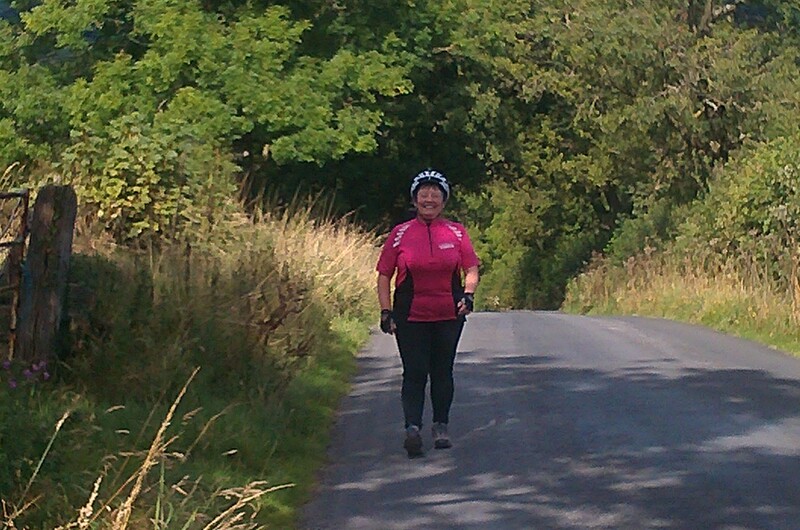 Jenny (bless her) had a few moments of tears, but quickly recovered, and we hauled the tandem to the top. And when you look for the payback, the welcome descent after the long climbs, it can be disheartening to discover the drop is just too steep for a laden tandem that relies entirely on two V brakes for its stopping power. 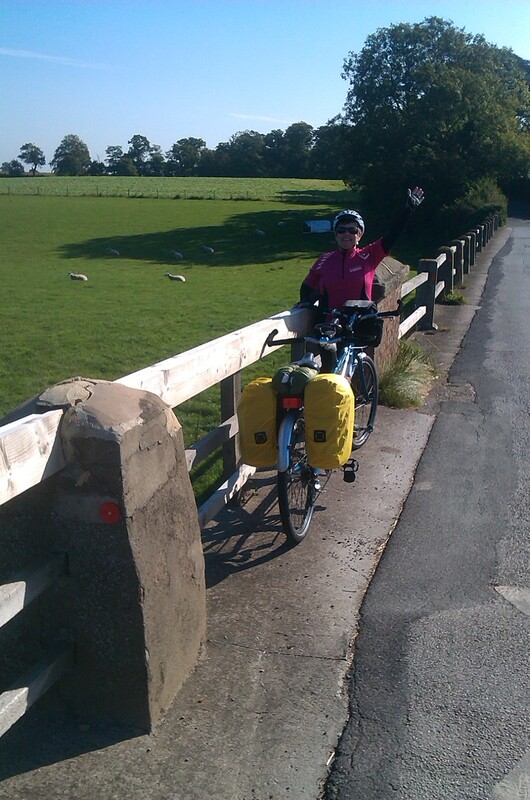 The drop down into Pateley Bridge approached 20% at times so, guess what? Instead of throwing caution to the wind and hurtling down into the town, we actually had to walk down much of the descent. Adding insult to injury? However, the saving grace at the end of the day was to check into the Harefield Hall hotel in Pateley Bridge, discover we had a room with panoramic views over the open countryside and, after a challenging wet day, find we could sit by a blazing log fire and let the warmth of the flames soothe away the aches and pains. And the tandem? 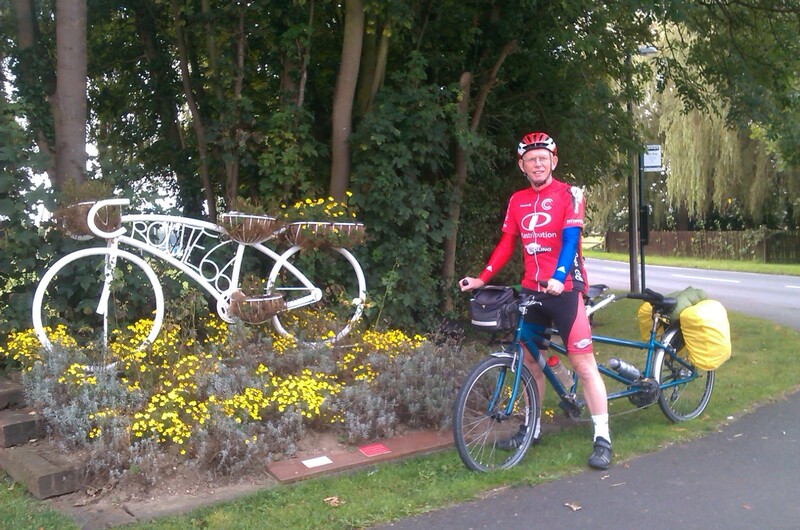 We simply wheeled it, over beautiful carpets, into the one of the front lounges of the hotel…….spoil the tandem, spoil the customers. And tomorrow was to be another day…….. The wanderers have returned. In many ways, this has been an epic journey, especially for Jenny. 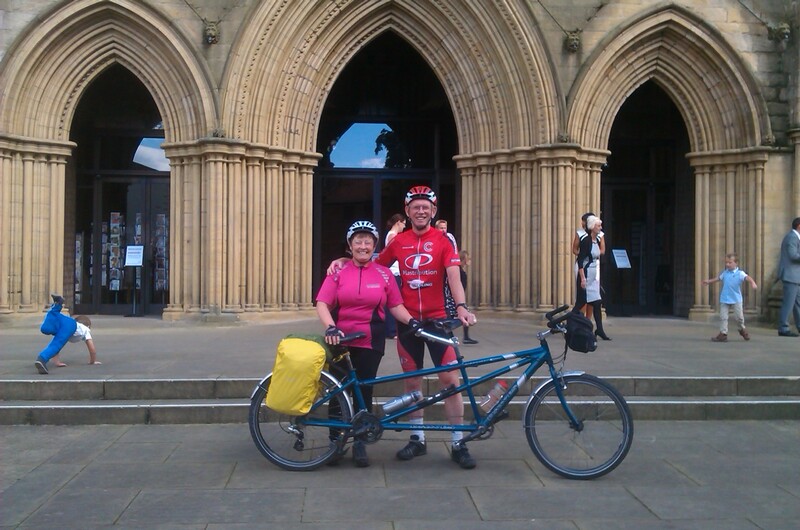 It is 33 years since she has done a multi-day unsupported tandem ride of this length. Why so long? Well, I’m sure there are a few good stories to tell there, but suffice to say ‘life just got in the way’. We shared the planning: I sorted out the logistics of the ride itself, the projected stopping points, and how to get to and from the start and finish (always a problem with linear routes, especially with a tandem). Jenny sorted out the accommodation which, given that it coincided with the first week of term, should have been easy……but far from it. September is the time for the silver generation to head off on late summer breaks, so there was much competition for just about everything. It was just by chance that we met Gary at the start of the ride. He happened to be one of the volunteer route designers for Sustrans, and he was waiting for a colleague to arrive to confirm a bridge closure on the route. Thanks to him, we set off forewarned of a diversion which could have made a big difference to the projected day’s mileage. Astonishingly, we managed to climb a 16% hill, but then thought the better of such lung-busting exertion when more such hills presented themselves. There’s no shame in walking. Many solo riders were doing the same. If you have never ridden a tandem, you need to know there is a law of physics which will limit your success at climbing hills but, conversely, that same law will see you descending at break-neck speeds, hurtling down much faster than the average solo rider and, sometimes, much faster than your brakes will safely permit. If not on their bikes, cyclists will generally be found skulking in tearooms! 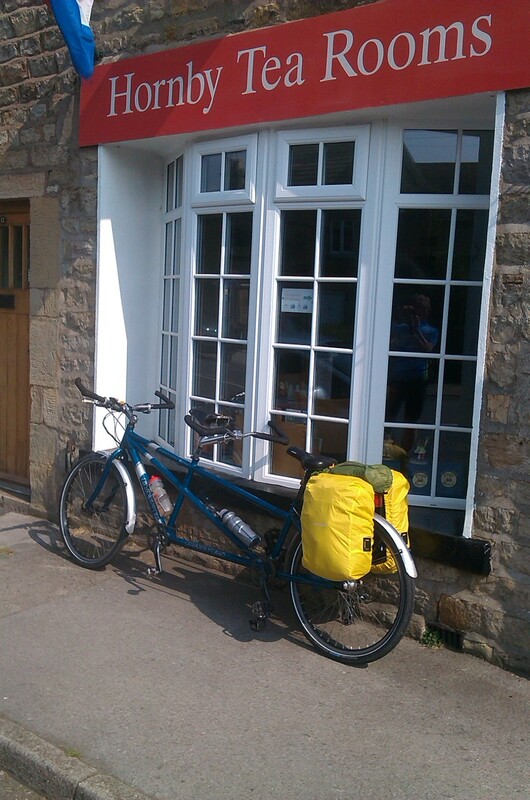 And so to Giggleswick, just outside Settle, to the Craven Arms, where they were able to squeeze our tandem into their shed, and provide us with a comfortable room. Chatting to one of the locals in the bar, we were quietly informed of the challenges of the next day’s route. 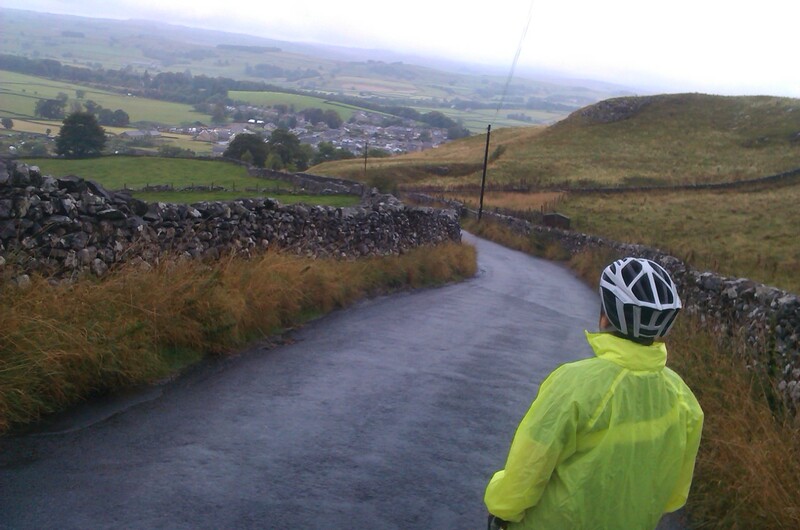 The climb out of Settle, he told us, is difficult even in a car! But more of that in the next post…….